More than 6,500 drivers have been caught speeding since average speed check cameras were introduced on the M4 in south east Wales, figures show. The cameras between Junctions 24 (Coldra) and 28 (Tredegar Park) trigger penalty notices when the 50mph limit is exceeded. Forty three million vehicles - 110,000 a day - have driven through the stretch since September 2009. The body which polices it said a "tiny fraction" were flouting the law. Jim Moore, manager of the Wales road casualty reduction partnership said: "It is encouraging to see that, on the whole, motorists are complying with the reduced speed limit of 50mph while important roadworks take place. "We hope that this compliance continues over the next few months while work is completed for the safety of motorists and the roadworkers, who are operating day and night." 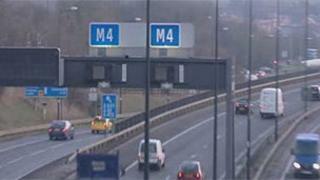 The intention is to replace the average speed cameras with a variable speed limit like that on the M25 near London. The RAC foundation welcomed the figures. Elizabeth Box from the foundation said: "Lower speed limits are often applied to motorway road works to improve road worker safety so it is good to see that 99.9% of all vehicles on the M4 in Gwent have stayed within the 50mph limit." Plans to build a £1bn relief road around Newport to ease congestion were scrapped last year. The Welsh Assembly Government has not yet announced when it proposes to push ahead with plans to link up a dual carriageway which runs through the Corus site at Llanwern, with the Southern Distributor Road, to provide an alternative route around the south of Newport. The scheme could be delayed because of budget constraints. Average speeds have dropped to 49.4mph since the cameras were introduced, but a top speed of 95mph has also been recorded. Works to install the variable speed system on the M4 have been completed but lane restrictions associated with the concrete barrier replacement scheme are still ongoing. The Welsh Assembly Government said it regarded road safety as a matter of paramount importance and so the figures provided by Go Safe were "particularly pleasing". A spokesman said: "The vast majority of drivers are adhering to the temporary limit and that can only be good news for our workforce, who often work through the night, and for other road users. "The average speed cameras will be removed from the M4 when work on the central reservation barriers and variable speed limit system is completed. We expect this to be by the summer of next year. "Decisions on any future funding arrangements for speed cameras will be made in due course." Professor of transport at the University of Glamorgan, Stuart Cole, said the average speed check cameras were successful at keeping traffic flowing during peak times, but did annoy drivers travelling outside rush hour. He told BBC Wales: "In the long term the variable speed limits will be preferable as they get more traffic through in the same period of time and it will contribute to solving the problems around the Brynglas Tunnels. "I don't know what the final decision on the Newport relief road is, or whether it will be delayed because of budget constraints, but it is a relatively low cost programme - £120m compared to the previous £1bn scheme."